es, festivals, fairs and parades so common in the Alexandria area and nearby Washington, D.C. My paintings are primitive folk art prints and historical folk art prints that portray a true experience of those places. Painting has been my passion since I was a little girl and will always be a part of my life. My love for America is inspiring and patriotic to me. I started painting scenes of America in 1979, capturing its cities, countryside, seacoasts, farmlands, and forests. I use vibrant colors and a cast of playful characters to create an array of magical scenes that combine a whimsical spirit with a hint of nostalgia. My cheerful and detailed paintings capture viewers of all ages evoking smiles and pleasant memories to last forever! When I paint, my prints allow you to live in the scene and be able smell, taste and hear what you see. Like most contemporary folk artists, I focus on happy and historical events and holidays that result in my joyous paintings. American cities are fascinating to me and I make frequent visits to places like New York City and capture what I experience in my paintings. My artwork can be seen and purchased on my online gallery, my Alexandria gallery and numerous other galleries across the US. My paintings are seen in very historical places including the White House, the National Archives, Winterthur Museum, the American Museum in Bath, England, the National Horticultural Society and others. 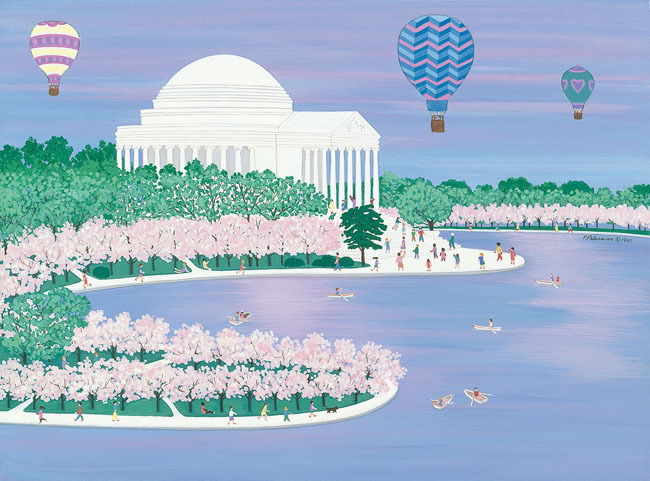 My artwork has appeared on many posters and publications including the program cover of the National Easter Egg Roll at the White House, the UNICEF Corporate Christmas Card Collection, Historic Alexandria, Gadsby’s Tavern Museum, Gunston Hall Museum, Woodlawn Plantation Museum, Winterthur Museum’s Point to Point Races, United Card of Japan and others. Original paintings are sold at the Frank J. Miele Gallery in New York City. Hi Pat – I love your artworks. Do you have any pieces with Burke and Herbert within? Hi Pat. Linda and Bill Brown want to say how ya doing. We are retired in Williamsburg. Everything looks wonderful as always. Hope this finds you well. Retired? Hard to believe! We are as well as can be expected for people our age, having fun traveling and still doing artwork.Let’s keep in touch.